Tis the season for your Instagram feed to be filled with holiday gift guides. Gift guides can be such a great resource whether you're needing ideas for the beauty lover or your ever so hard to buy for boyfriend or spouse! My friend Catherine over at SpringerMade recently encouraged her followers to join her in shopping small this season as much as possible. 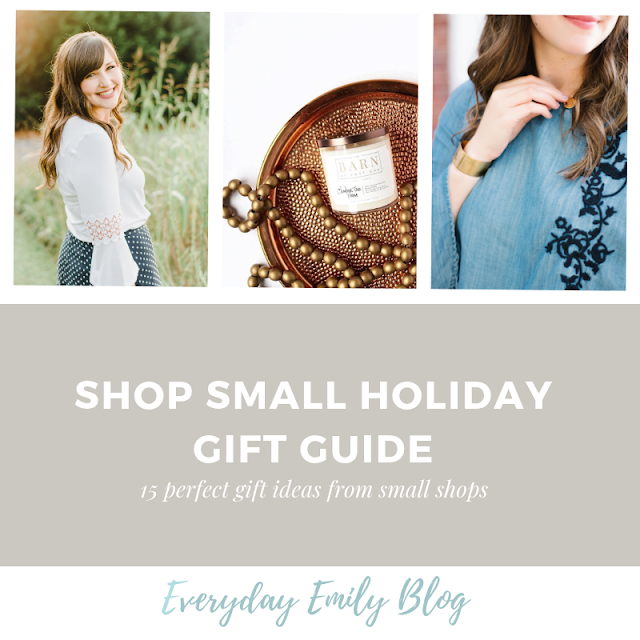 This gave me the idea to put my own spin on a holiday gift guide this year and make it a "Shop Small" edition! I hope you'll join me in supporting these small and local shops this Christmas season! 1. 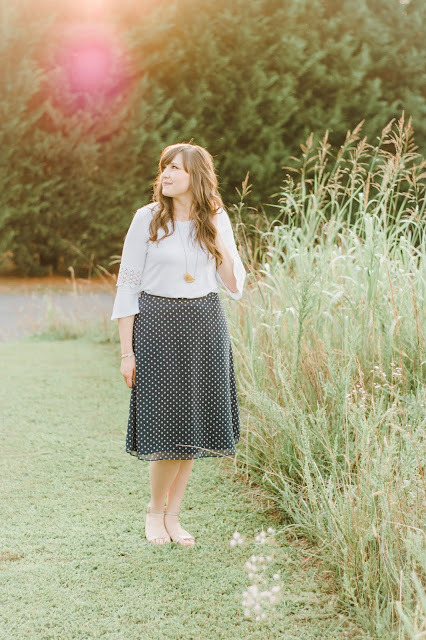 SpringerMade - Catherine is an Army wife, mom, and amazing creative. She can personalize just about anything and is so fun and easy to work with. I've already purchased some Christmas gifts from SpringerMade, and I can't wait to gift them to my family! 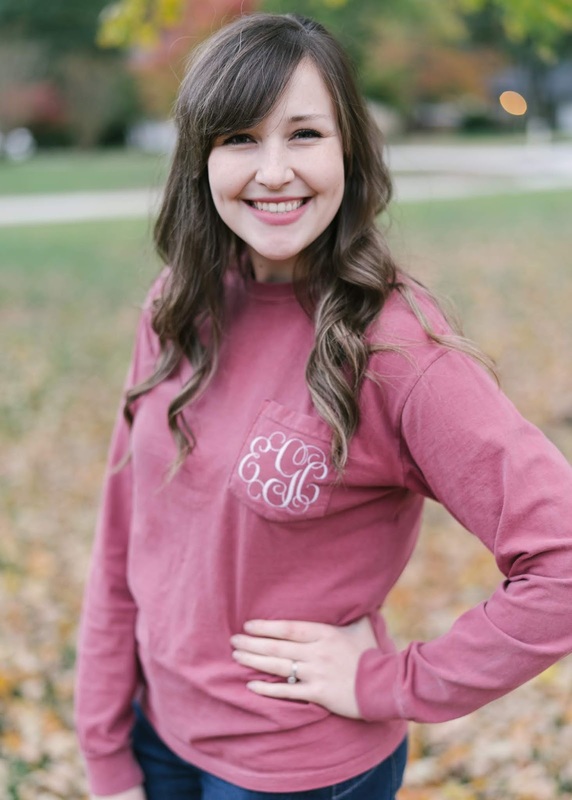 Since we all love a coupon code, you can use the code EMILYG for 15% off! 2. 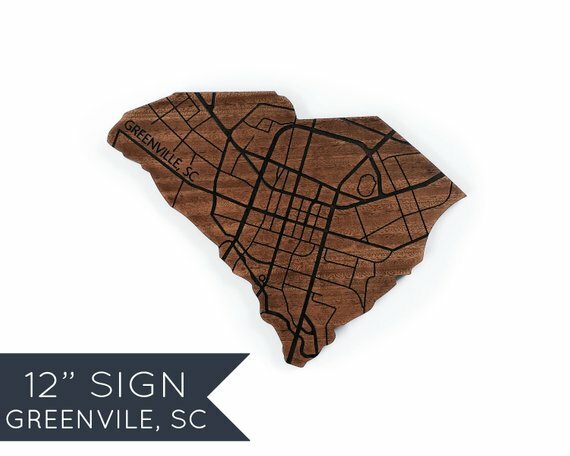 Local Stature - This local maker crafts beautiful state signs from wood. 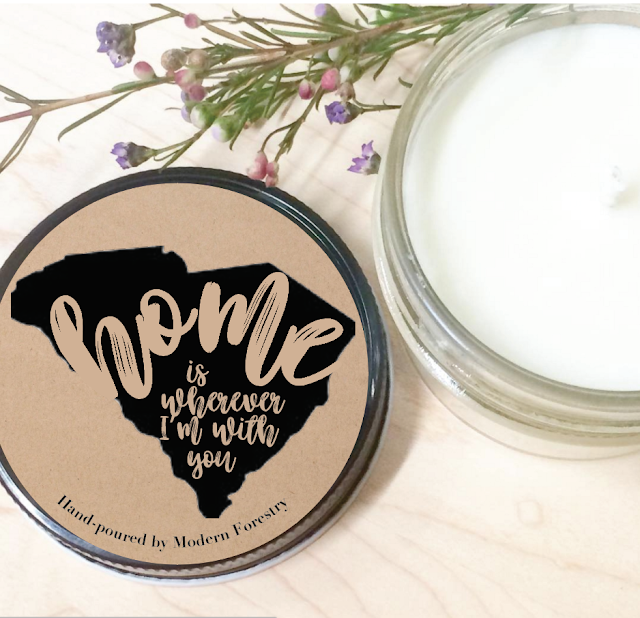 These would add such a beautiful and unique touch to your home, and they're the perfect way to commemorate special places in your life! 3. 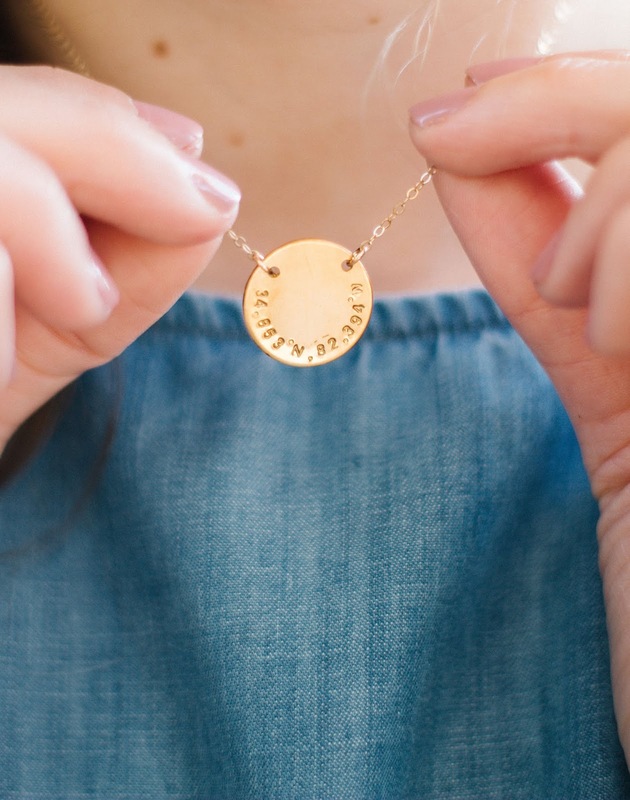 Stamped and Finch - I've shared all about this beautiful jewelry here, but if you love dainty and meaningful jewelry, you'll fall in love with Stamped and Finch! 4. Modern Forestry - I've owned several candles over the years from Modern Forestry, and I absolutely love their fragrances. If you're looking for an affordable and delicious smelling candle, look no further! I also have some of the wax melts which make really nice but inexpensive holiday or hostess gifts! 5. The Barn at Post Oak - Clearly I have a thing for candles... I just discovered The Barn at Post Oak candles this year, and they are made right here in Simpsonville, South Carolina! I love how they do surprise boxes each month. It's a great way to try out different scents in your home. Morgan is seriously the kindest, and I am thrilled to support this sweet local company! 6. Third Floor North Photography - Giving the gift of photos is such a unique and creative gift idea. 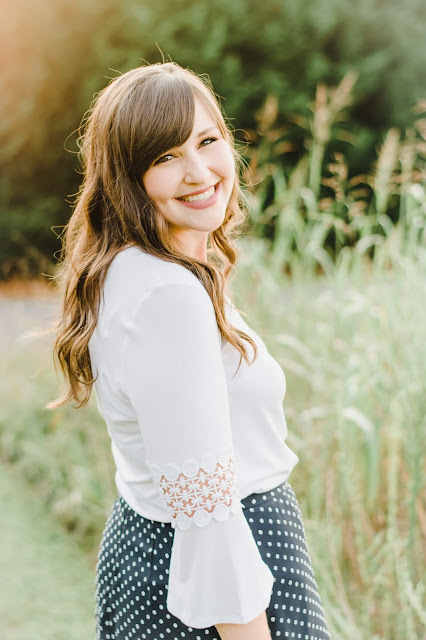 If you're wanting to gift anyone in your life with a photo session, I would reach out to my sweet friend Ashley over at Third Floor North Photography. Ashley has done photos for Kyle and me as well as photos for my blog, and her work is so beautiful. She took these photos below, and I am thrilled with how they turned out. This is a great way to support a local small business. 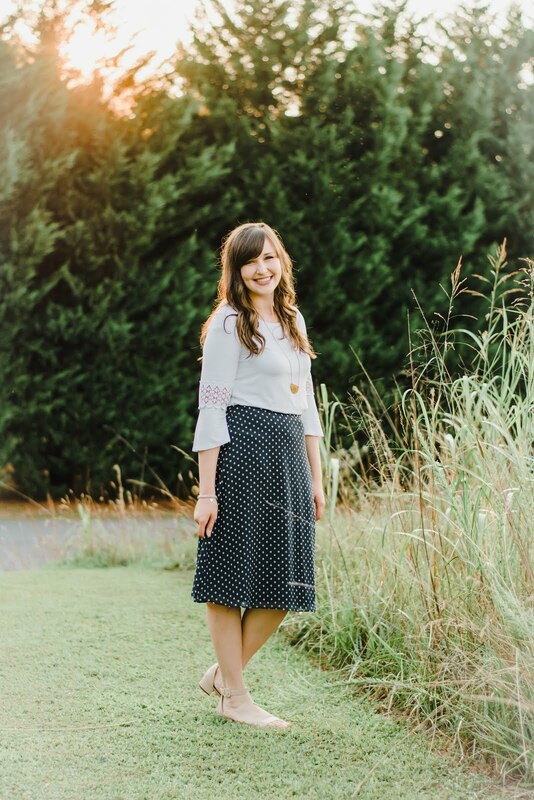 Ashley is so sweet and fun and one of my best friends, so I know for a fact you'll love working with her! 7. 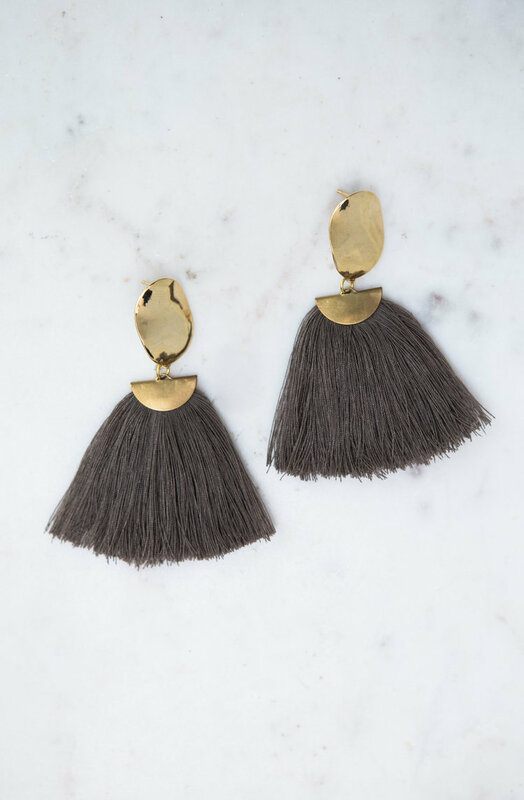 Olive + Grey - If you are local to Greenville, you can find Olive + Grey products in several local shops. My husband has a couple of their t-shirts, and they are both stylish and high quality. We also have some of the mugs and their Greenville Liberty Bridge sign in our home! 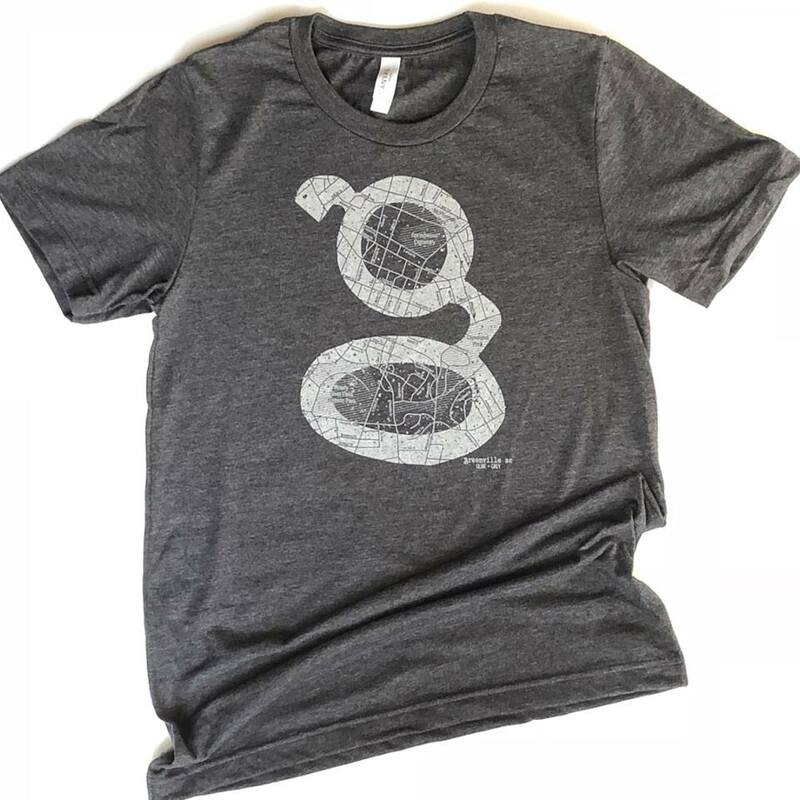 If you want to represent Greenville, look no further than Olive + Grey! 8. 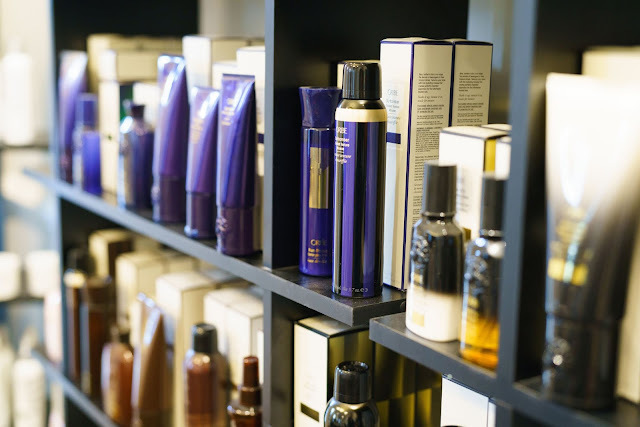 Salon Adelle - Gifting a service to someone might seem a little different, but it's a creative way to think outside the box and gift someone with a practical gift. I had my hair done at Salon Adelle this past summer, and I absolutely would recommend their services! 9. Organic Tan Face and Body - Organic Tan offers a monthly facial subscription - what a perfect gift! Who doesn't want a little monthly treat to look forward to in addition to beautiful glowing skin?Organic Tan offers so many amazing treatments that all of the women in your life would enjoy. 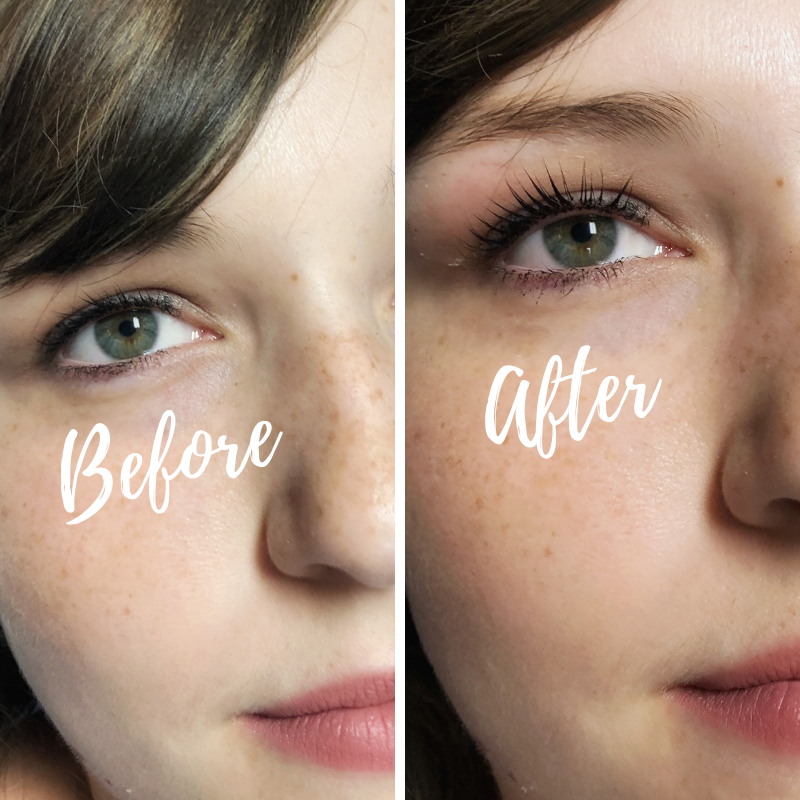 You can read about my lash lift experience here if you're interested in that particular service! 10. Goosefeathers - If you've never been to Goosefeathers in Traveler's Rest, you're missing out. 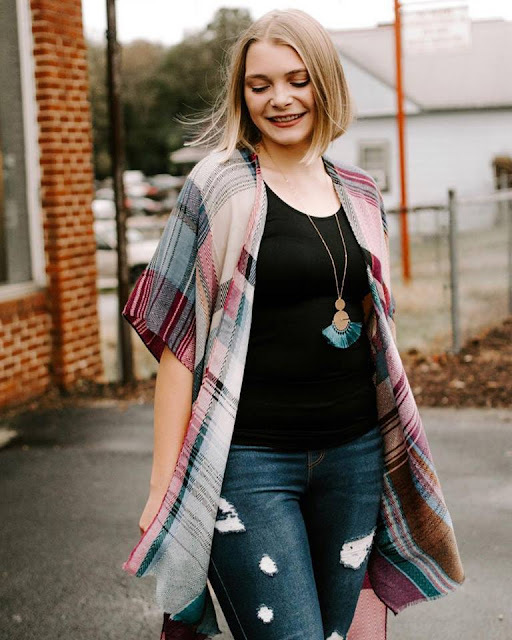 Whether you're shopping for the stylish teen in your life or your thirty-something gal pal, you will be able to find the perfect outfit to gift this Christmas! They offer boho style clothes and fun jewelry that your friends are sure to love. 11. Spectrum Handcrafted - I typically keep my wardrobe pretty basic, but I love to accessorize with bold statement jewelry. I've owned a Spectrum piece for several years now, and I just adore their unique handcrafted jewelry. 12. 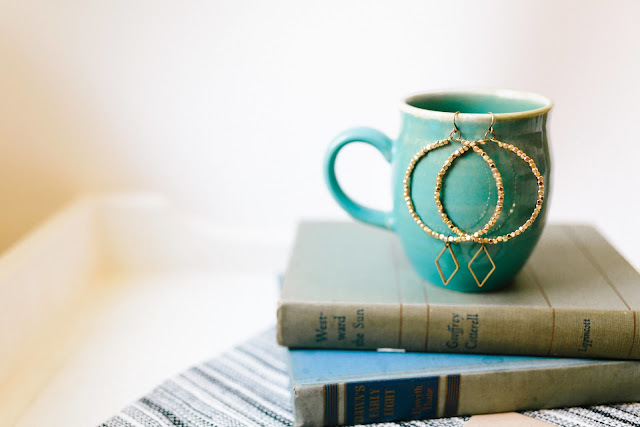 Milk and Honey Market - Milk and Honey Market offers so many beautiful jewelry pieces while supporting women across the world. I recently picked up a pair of the Camilla Wood Studs, and they are just so beautiful and unique! 13. Verdant Market - I recently found out about Verdant Market through a local craft fair. 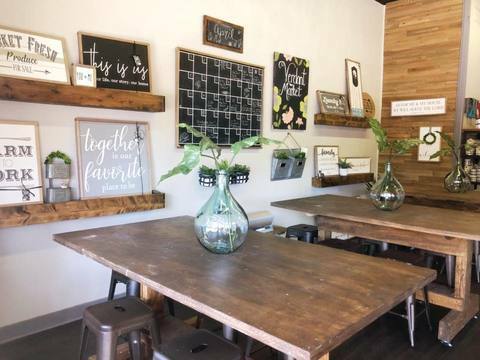 They not only make beautiful signs for your home, but they also offer workshops so you can make a sign for yourself! Sign you and a friend up for a workshop, and you can check one more person off your shopping list! 14. 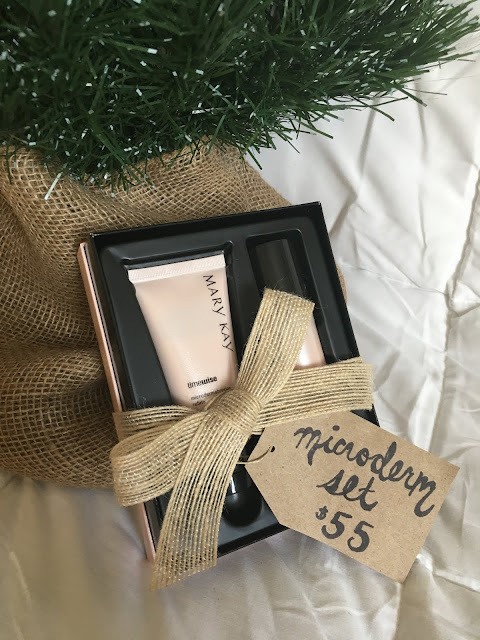 Mary Kay - I've used several Mary Kay products over the last year or so, and I am impressed with the quality at such a great price point. My sweet friend Jess is a Mary Kay Consultant, and she is as beautiful inside as she is on the outside. If you're on the fence about Mary Kay, Jess can answer all of your questions! They have a great skincare system that you could gift to any woman no matter their age! 15. 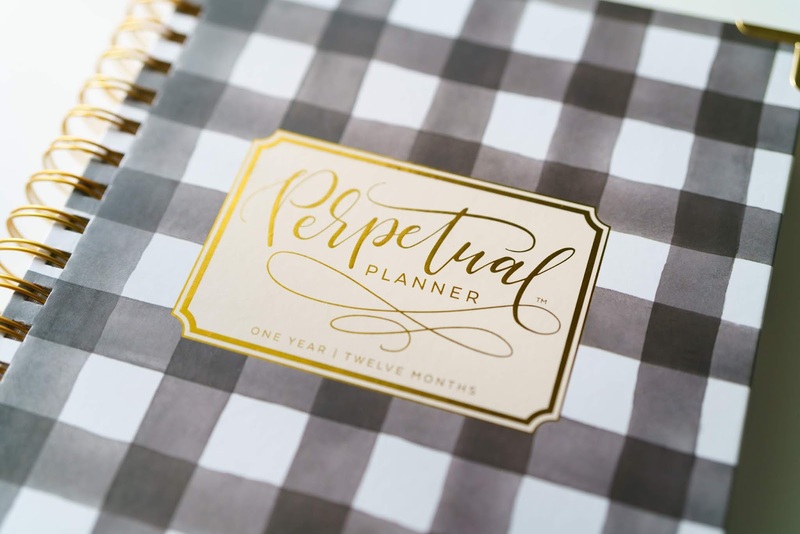 Carrie Elle Planners - This would be the perfect gift for all of the busy ladies in your life. I have a Carrie Elle planner, and let me just say if you're looking for a quality and beautiful planner, look no further! I'd love to have you join me in supporting your own local businesses and small shops!